In view of most of our customers' feedback that 1500-lux projectors do not satisfy their requirements, Vivimage set about upgrading the brightness of their projector to be 50% brighter to offer our customers a more cost-effective product. It is great for watching movies and sports games, holding parties, or parent-children interaction. Whatever the occasion, this mini projector brings lots of fun to your family and friends. The Vivimage projector offers an ultra-big screen size from 32" to 176" at a projection distance of 4.9-16.4ft. For an optimum viewing experience, we recommended a projection distance of 5.9 to 6.6ft. This will give you and your family an awesome home entertainment experience. Vivimage projector adopts the latest dual fan cooling technology and reduced fan noise design. It also uses built-in stereo speakers, which restore every detail of sound for accurate audio in every scene. It's a great addition to your movie night with your family. To avoid projector overheating easily as happens with other projectors, the Vivimage+ is equipped with an innovative cooling system that provides very efficient heat dissipation. With the improvements we've made to this latest upgrade, there's no need to worry about the projector overheating. Compared to LED screen's (TV/Computer/Smartphones/Tablets) direct light, Vivimage projectors take the principle of diffusing images with more gentle light, greatly reducing harm to the eyes. Please take a break from viewing every 2-3 hours. Dolby sound is not supported. If there's no sound, please turn off Dolby Digital in you device. For better viewing effect, use in the darkest possible environment. UPGRADED WITH 50% BRIGHTER IMAGES: Vivimage Projector is Powered by MStar Advanced Color Engine. 2018 upgraded LED lighting provides +50% brightness than ordinary projector. Supporting 1920x1080 resolution, 2000:1 contrast ration which is ideal for home entertainment. Not recommend for PPT or office presentation. ADJUSTABLE PROJECTION SIZE: This portable projector displays images between 32 to 176 inches, with a projection distance of 4.9 to16.4ft. For optimum viewing, placing the projector at a distance of 5.9 to 6.6ft, while adjusting the focus and keystone correction, will achieve a super-clear and bright projection. UPDATED COOLING SYSTEM: A newly-enhanced cooling and fan system generates the least noise of any home projector Vivimage has ever brought to Amazon. By enabling outstanding engineering, we've created the most enjoyable home entertainment experience at an unbeatable price. 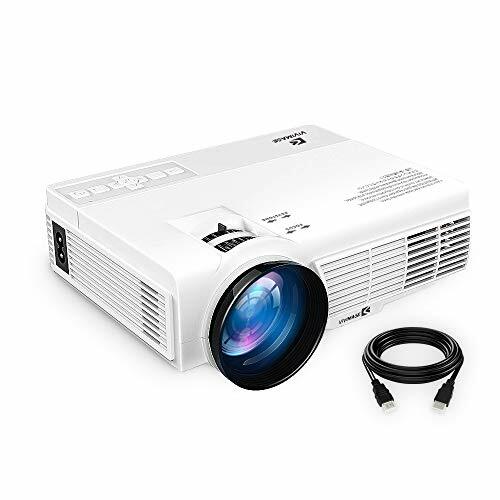 LEADING WARRANTY: Backed by a 3-year warranty, you have nothing to lose by purchasing this projector. Professional customer service & technical support is available. At Vivimage, our goal is to deliver impeccable customer service and impeccable home entertainment products.